Recently, “Blockchain” technology has triggered increased interest as a tool to improve transparency for climate change policy instruments, such as Monitoring, Reporting and Verification (MRV) systems, climate finance and carbon markets. Blockchain allows the exchange of information through a cryptographic protocol whose users are constantly updated and verified. 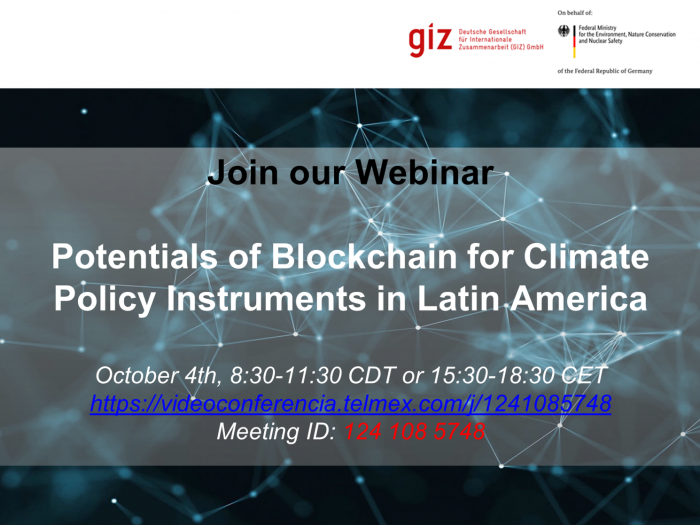 The project “Preparation of an Emissions Trading System in Mexico” in collaboration with Latin-American GIZ offices, is organizing a webinar to disseminate the results of a study on the potentials of blockchain for different climate change policies. The objective of the webinar is (1) to familiarize the interested public with the topic (2) to explore Blockchain’s potentials for Emissions Trading Systems and other public policies on climate change and (3) to facilitate dialogue between experts and the interested public. The first in a series of two webinars about blockchain and climate change took place on October 4. The second webinar is scheduled for November 2018.